It’s hard to clean from a hammock, but with method its not impossible. Grease + grime don’t stand a chance, not with powergreen® technology in your grasp. Each squirt of this all purpose cleaner, in all its lovely non-toxic glory, delivers a powerful cleaning punch with naturally derived, biodegradable ingredients. Cleaners derived from corn + coconut break down dirt, leaving nothing behind but the refreshing scent of Honey Crisp Apple. The Scent: Like biting into a fresh honeycrisp apple. This scent pretty much named itself! This is my â€œGo Toâ€� product. Iâ€™ve tried others but this is the best. Wish it came in other scents. Love this all purpose cleaner. It works great on my cambria quartz counter tops. This scent is my favourite so far. Highly recommend. I am loving the all purpose cleaners. They do a great job on my quartz counter tops. I have tried a few scents and so far this one is my favourite. You can use this all over the house. This is definitely a repurchase. I really enjoy using this product in the kitchen and bathroom. It really helps to get rid of grease and soap scum. Plus the scent is so unique and refreshing. Really good grease cutter. Helps getting finger prints off walls and greasy grime off the oven vent. Smells amazing. Smells so good, it (almost) makes you want to clean everything with it. And it cleans well, too. I cant get enough of the honey crisp scent! We use this and the dish soap as well. Cleans great, eco friendly. Cant go wrong! Smells fabulous and cleans great, I use it in kitchen and bathroom. I love this! A natural cleaner that actually works. It smells delicious! Smells great! Works well for not only dishes but pots and pans too! Good product but the smell is way too strong for us though we love apples. I use this one daily. 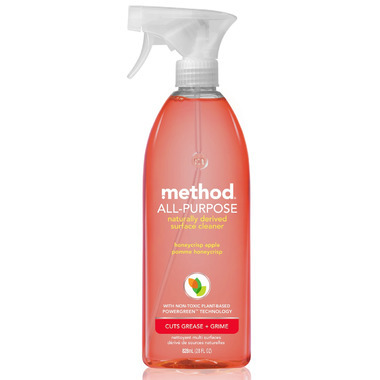 I love the scents of the method products and feel good using them. This product is so strongly scented that I had an immediate headache after spraying it. The smell lingered in my kitchen for hours. Yuck! Great product with a great smell! Use this all the time - LOVE. The smell is super yummy and it cleans wonderfully. LOVE LOVE LOVE .. great scent ! Smells so good , and cleans my countertops well!